What is this Proverb saying unto the children of God? How can we possess and obtain the blessings and the benefits from God? What was King Solomon saying unto us in this particular proverb? What is God saying to your spirit as you are reading this, explain? We can possess the blessings and benefits of God by being obedient and following his commands. We must do what he has instructed us to do. The proverb is saying in my opinion that when you obey the blessings Will follow you, but if you follow darkness the wages of sin is death. In my spirit I sense a strong unction to be diligent and consistent in our living for God. We should not compromise with the pleasures of the enemy. If we compromise we will be captured in the enemies trap. We are in this world but not of it. That the blessings is above our whole life situation in the wisdom that we do right and not the wrong we do in our life. By using his wisdom and understanding of his word. That our minds can be overwhelming in things we do. That if it was not for God on our side we would not be able to use what he possessed us with and if we do it God way we can overcome. When we begin to walk in obedience to our God we will reap the harvest of his righteousness. Seek ye first the kingdom of God and all his righteousness shall be added onto you. It's saying I the Lord thy God is all you need. No only do you think violence but it has overtaken you to the point where you speaking violence with authority and it has over rule your righteousness. Seek Gods guidance. We must proclaim the blessing and benefits of God being obedient following his commands proverb saying obey the blessing will follow you we have to be wise of the enemy traps. 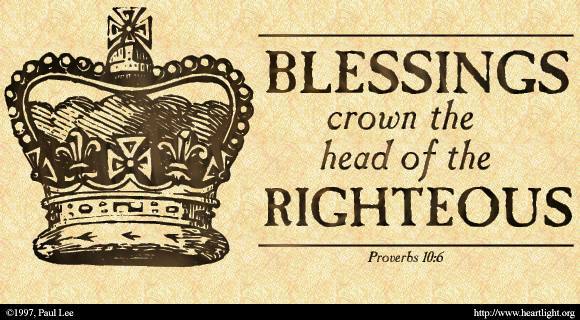 When man is righteous, people will be able to see just how blessed he is by the crown that sits upon the head, a crown that will sit lightly upon him at that. Whereas a violent man will be overwhelmed by the weight of his wickedness that will eventually lead to his collapse. Righteousness leads to purpose, violence leads to punishment. There are some blessings given to us simply because we are children of God. There are blessings that are given us because of our, faith, trust, and obedience. This Proverb is saying to us as children of God, that we have a choice, just as well as in receiving salvation, God says in Romans 10:9 “If thou shalt confess with thy mouth the Lord Jesus, and shalt believe in thine heart that God has raised him from the dead, thou shalt be saved.” We can obtain the benefits from God, by being obedient to His Word, dwelling under the shadow of the Almighty, yes we may go through situation, circumstances, sickness, but through it all we shall receive the benefits from God. King Solomon was letting us know, that if we walk as the children of God and the righteousness of our God, and the blessing of God is on our head, but if you desire to go the other way then violence covered the mouth. I am hearing God saying that if I take up my cross and follow him, I can possess the benefits from God, if I seek him diligently that I can walk in the blessings and obtain all the benefits and the fullness of God. What is this Proverb saying unto the children of God? A person, who is righteous, will never go hungry (Psalms 1:6). Righteous persons will thrive. Righteous people stick out in their environment as others rejoice in their accomplishments (Proverb 29:2). God over sees those living a righteous life (Psalms 1:6). The righteous way ends only in good (proverbs 11:23). Know that doing what is strait, sound, and honest will always win the day (Proverbs 10:6). Proverbs 15:21 says, “A man of understanding keeps a straight course.” Ultimately God’s blessings are on the head of the just. Conversely, violence reaps violence. One suffers the natural foreseeable consequences of his/her actions. Because of ones violence, God’s judgment befalls on him/her. The harvest of violence is the fruit of ones own violence, the outcome of others violence, to include but not limited to; violent, injurious, and mischievous acts perpetrated upon the intended target. The overwhelming (covering) of the mouth may be an reference to the ancient custom of covering the faces of condemned criminal. How can we possess and obtain the blessings and the benefits from God? be extended to you, but He is just. What was King Solomon saying unto us in this particular proverb? Interpretation of what I construed he meant: A person, who is righteous, will never go hungry (Psalms 1:6). Righteous persons will thrive. Righteous people stick out in their environment as others rejoice in their accomplishments (Proverb 29:2). God over sees those living a righteous life (Psalms 1:6). The righteous way ends only in good (proverbs 11:23). Know that doing what is strait, sound, and honest will always win the day (Proverbs 10:6). Proverbs 15:21 says, “A man of understanding keeps a straight course.” Ultimately God’s blessings are on the head of the just. Conversely, violence reaps violence. One suffers the natural foreseeable consequences of his/her actions. Because of ones violence, God’s judgment befalls on him/her. The harvest of violence is the fruit of ones own violence, the outcome of others violence, to include but not limited to; violent, injurious, and mischievous acts perpetrated upon the intended target. The overwhelming (covering) of the mouth may be an reference to the ancient custom of covering the faces of condemned criminal. What is God saying to your spirit as you are reading this, explain? Here Malvin (son), take this (word) and put this in your toolbox (tablet of your heart). (Spiritual competencies/indwelt/understanding there of/to-wit love) with out the worker (Five fold ministry/Church) are tools with out a worker. God gives you the tools and dispatches you to the job. When you get to the job and obtain the scope of the work to be done, you will have the tools that you need to get the job done. The particulars of each encounter are so dynamic that the application of the process of repair is considered fluid from start (alpha) to finish (omega). It is our job to allow (not quenching the Holy Spirit the Holy Spirit) to guide us through this process (lineing up the circumstances with the Word). What King Solomon is saying to us is that we are royal in gods eyes and we are a blessing to many people we are found righteous it the world eyes. When we fight for the lord as the enemy try to test us he want to see if we are going to fight the enemy and are we going to cast him out when we do that the enemy begin to get weak and overwhelms and he dont know to do. So our mouth is made to speak blessing over us and to curse the devils to the ground when i mean curse i mean casting him out or rebuke him on his little ways.So this is what i got out of it. We have to use wisdom in every aspect of our life and seek God all the time for that wisdom. That we do not just up and do anything, but we seek God. We have to not look at things our way, but really , what will Jesus do, the flesh would want us to fight argue, cuss and all sorts of things, but wisdoms will give us the answer. Just doing nothing is best, because we have already overcame. When you are righteous you receive the blessing of God, but when you are wicked you are cursed of God. The Bible teaches, chose who you serve on this day I sat before you life and blessings/curses and death. What is God saying to my sprit now. I am for you not against you to bring you into an expected end. We can possess and obtain the blessings and benefits of God by being obedient to His word and by seeking and walking in HIS wisdom daily. King Solomon was saying: By doing what is right in the sight of God Blessings will be upon your head but if you do wicked things you will continue to speak/proclaim violence out of your mouth into your life. God is saying to my spirit:"Walk uprightly before me, do what is right and I will give you the desires of your heart."